Gear rack converts rotational motion into linear motion when a spur gear is run against it. 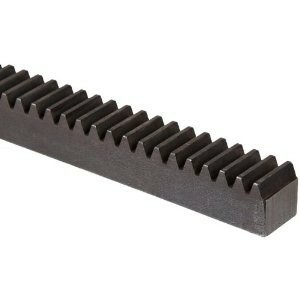 The rack is essentially a gear with the teeth equally spaced on a straight line. Gear rack itself is flat, and such a system is utilized in conjunction with a circular gear (or pinion). Rotational motion applied to the pinion will cause the rack to move to the side, up to the limit of its travel. The benefits of utilizing a gear rack system (rack and pinion) are that it eliminates backlash for smooth operations and these system are known for quiet operation. Gear rack is utilized often in indexing operations where accuracy is critical. Industrial gear rack is commonly available in both 20 and 14-1/2 degree pressure angles, it is important to differentiate which rack is being utilized if replacing an existing system.